I don’t know why, but it always seems that sharing a meal with friends is more cost-efficient (and certanly more fun) than eating at home. Why? You can buy your meat in bulk without worrying about it going bad. You don’t have to worry about purchasing or preparing a whole meal, only a portion. You get to try things you will never have cooked in your own home. 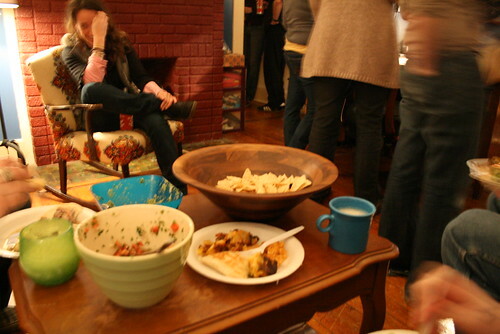 A potluck is an excellent social gathering. It also is much less expensive than going out with your friends. The best, comprehensive article I’ve read is The Art of the Potluck at Get Rich Slowly. If you factor in the savings of substituting BBQs and potlucks instead of going out with friends, you can easily save $20 per gathering, at least $100 a year for us. I would love to type more, but I’ve got a potluck to get to.